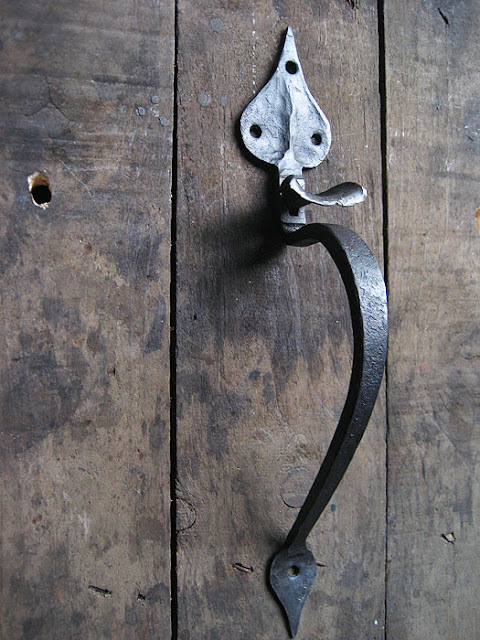 From the old Smithy in the Dales village of Dent, near Sedbergh in Cumbria, UK, Lucy produces hand-made pieces of bespoke ironwork using an open coke fire, and the tools and techniques employed by generations of blacksmiths. This fantastic traditional Suffolk latch set caught my eye, it comprises the handle with thumb-piece, latch-bar, keeper and staple. Available in a standard waxed finish for inside use or unwaxed (upon request) for home painting. Love it! Glazed donut from 7-11. 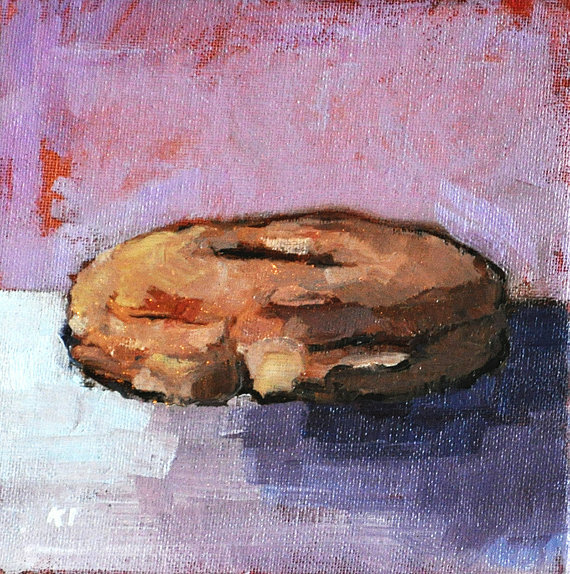 6 x 6 inches, oil on archival canvas board. "When I was toiling for the man in cubicle land, I wanted to feel the sun on my face. I stepped out from under the fluorescents and I started painting the California good life. I wanted to embrace the beauty you can find in unexpected places. Where can you find beauty in the unexpected?" 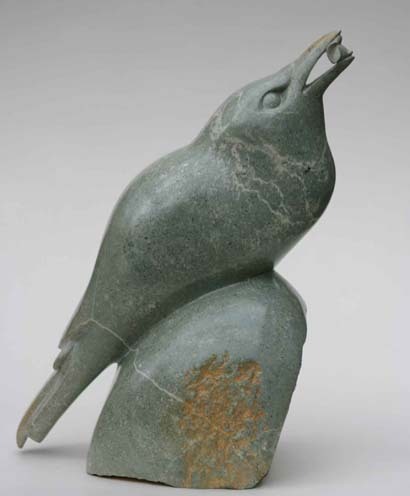 This amazing Bee Eater has been hand carved from Opal Stone by Jennifer Tetlow. Using traditional tools and methods, all of Jennifer's work has the wonderful individuality and character that is special to work created from natural raw material. Size: 12" x 8 " x 15". Beautiful! 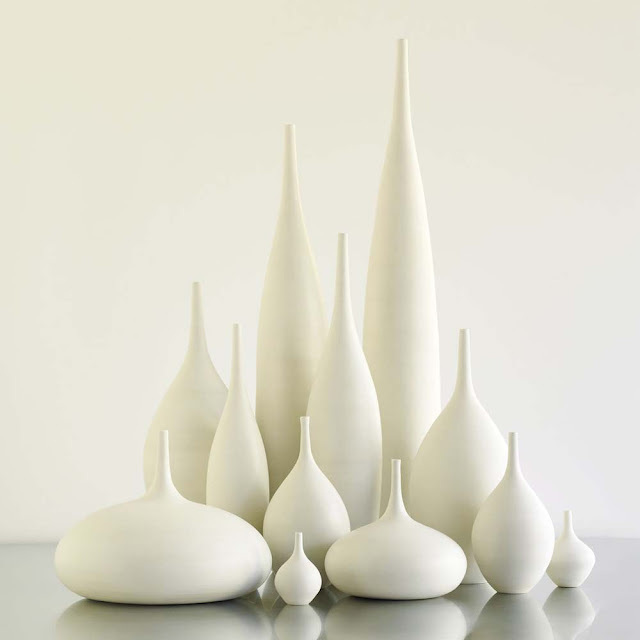 A grand cityscape of 12 wheel thrown stoneware bottles in a clean, modern matte white. Line them up on a fireplace mantel or create a striking sculptural tabletop centerpiece…this collection makes a bold, modern statement and will make you smile every time you walk into the room. This collection can also be broken up into many smaller groupings for different rooms. The largest piece is 24" down to 3". Clear glaze inside to hold water and a thin stemmed flower. Each piece signed Paloma 2012. 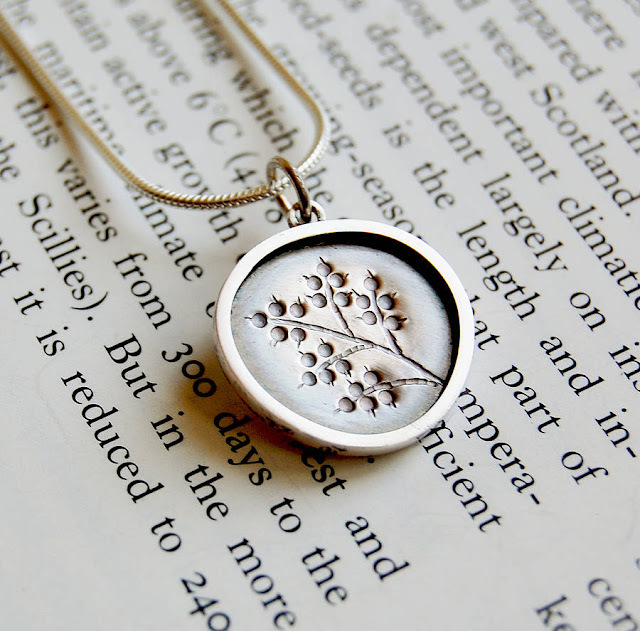 This necklace comes from a range inspired by the changing of the seasons and how they are observed in nature. Here, berries respresent late summer, harvest time and the transition into Autumn. 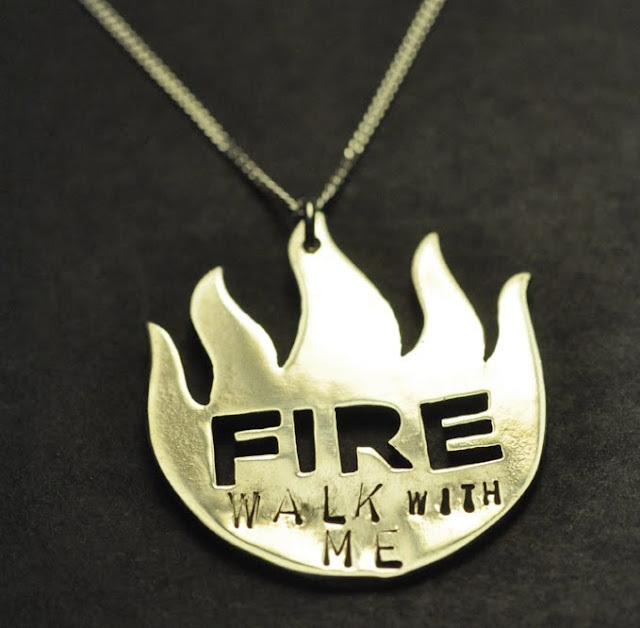 The pendant is entirely handmade from sterling silver. Each pendant is hand stamped to create the design, making each one unique. The pendant measures approximately 1.5cm x 2cm and hangs on a 16inch (40cm) sterling silver snake chain and comes in a gift box tied with ribbon. Woody's short rear fenders are just that…a short fender designed to mount to the rear seat stay brace to keep the spray off of your back. Choose from a variety of woods such as Walnut, Maple, Mahogany, Teak, Bubinga, Oak, Cherry, and Leopard wood just to name a few. 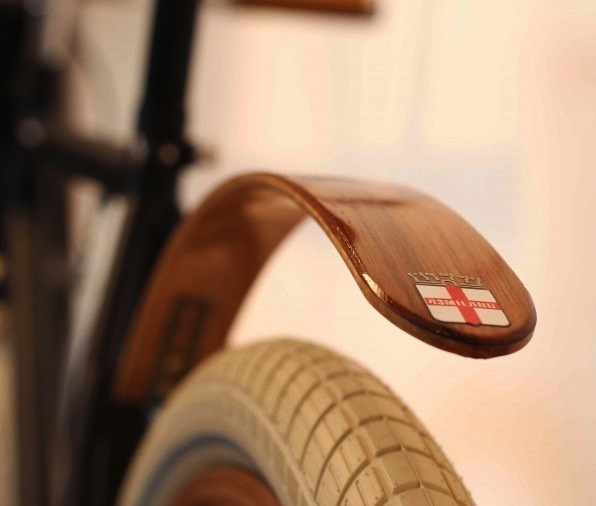 Different wood can also be combined to create a unique fender just for you. Each fender is laminated with slow cure epoxy and the mount hardware is stainless steel or beautiful brass. Decorative, fun and just a bit geeky! A fantastic quality digital print from an original screen print design. Print features aqua green and coral orange block colour with stylised halftone black detailing. Printed on 224gsm Perfect Image stock. Love it! 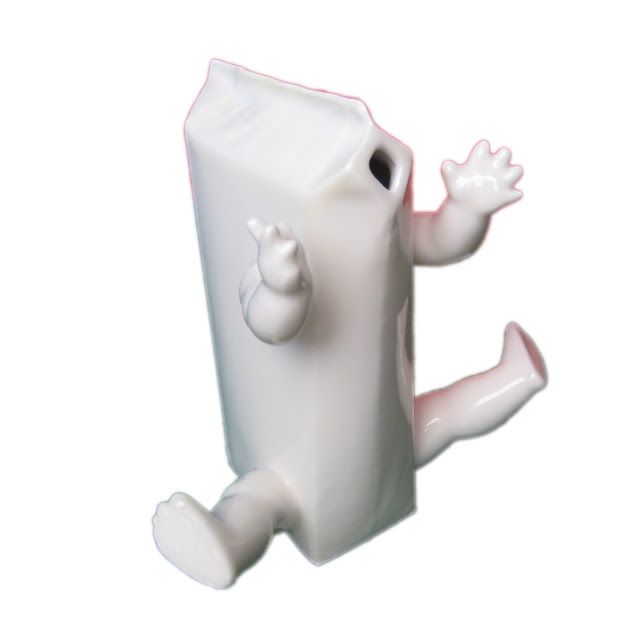 I love this made to order ceramic milk carton from KRASZNAI ceramics – what a great use of doll limbs! A highly unusual and fun piece from Barcelona. 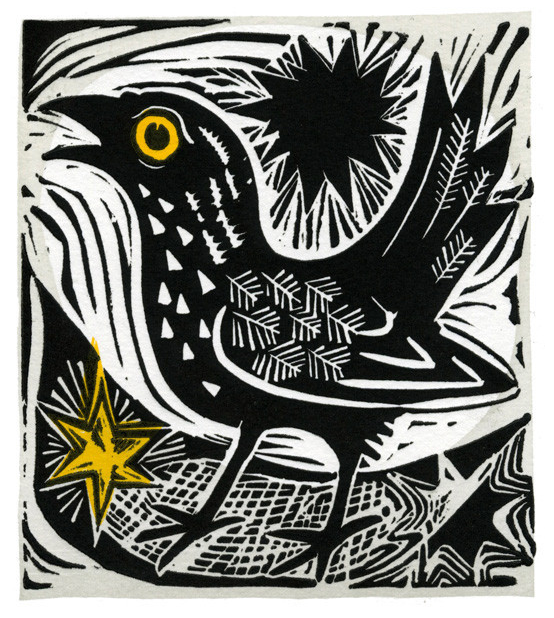 This beautiful linocut is from the fantastic Mark Hearld @ St. Jude's. It's a mounted, unframed print. Image size: 105mm x118mm. Edition size: 95. 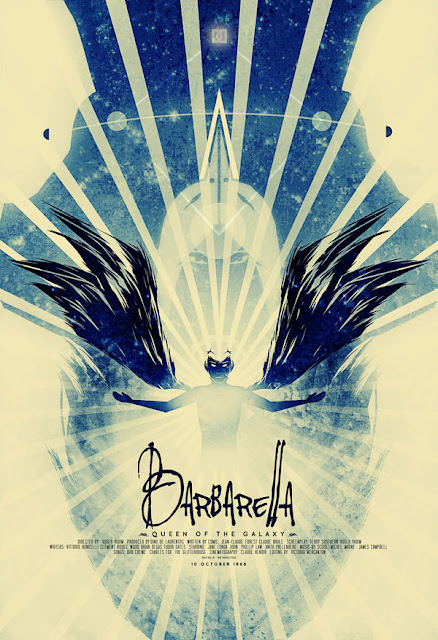 This is an original limited edition print, signed by the artist. Love it! 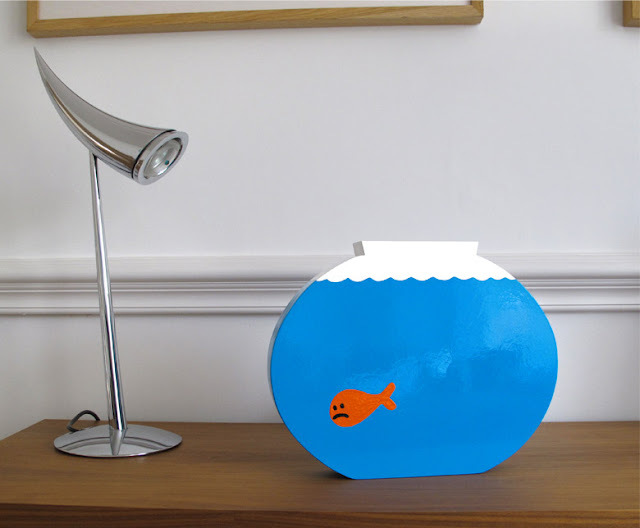 A great little tutorial with a step by step guide to making a handy storage bucket to fill with all your wonderful bits and pieces. As featured in the book – State of Craft, see more details here. All you have to do is purchase the Etsy listing (only £2.50) – just click the photo above to see the listing!, once your payment is received your name will be added to a secret blog where you can view the tutorial whenever you like. It has plenty of great photos to guide you through and detailed step by step instructions with all measurements to make your own set of handy storage buckets. 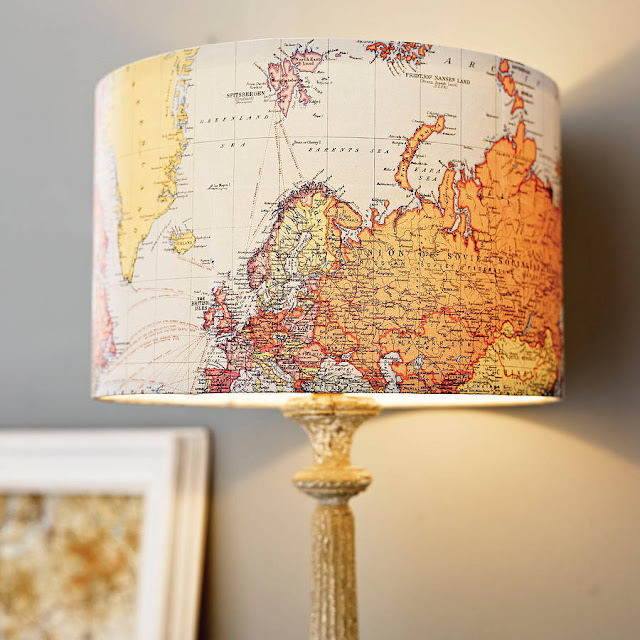 Created by Helen Rawlinson (UK based textile and lighting designer) all you need is a Google account to log in. You will be sent a special link to the blog within 24hrs of payment. This is a special fund raising exercise in aid of Helen's brother and his family who are about to embark on a crazy coast to coast cycle ride here in the UK. Helen's niece was born with Prader Willi Syndrome and it's with great thanks to the PWSA that they receive help and support for her disability. All net proceeds of this purchase will be donated to their cause. You can find out more here. Available for one week only 21/07/2012 till 27/07/2012. Please blog, facebook, tweet and generally spread the word!! 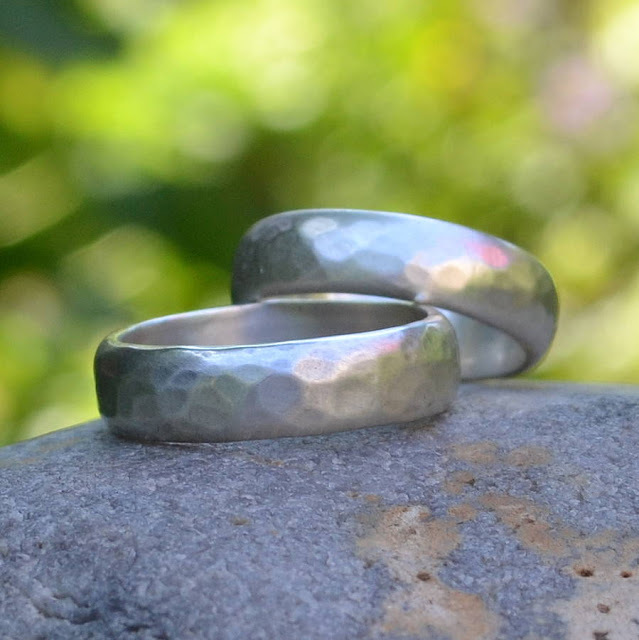 Handmade silver wedding ring, beautifully made to order in sterling silver in your choice of texture and finish by Mary Larkin, the designer/maker behind muriel & lily. Your ring will be unique, simple and incredibly personal to you. 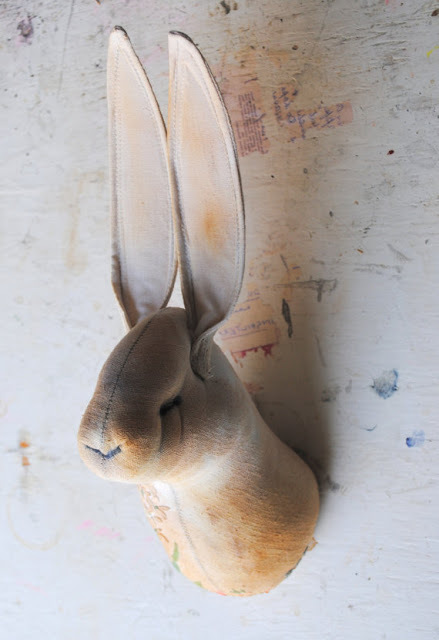 A soft sculpture textile hare head. Stuffed very firmly and made with a lot of love and care from thick cottons. Made from vintage rescued hand embroidery. Using inks, teas and acyclic paint to bring him to life. Would look great anywhere in the home or den. Each one is completely unique. Flaws and odd stitching are to be expected and are celebrated. He is approx 31cm in height from ear tip to base and his width is 9cm. 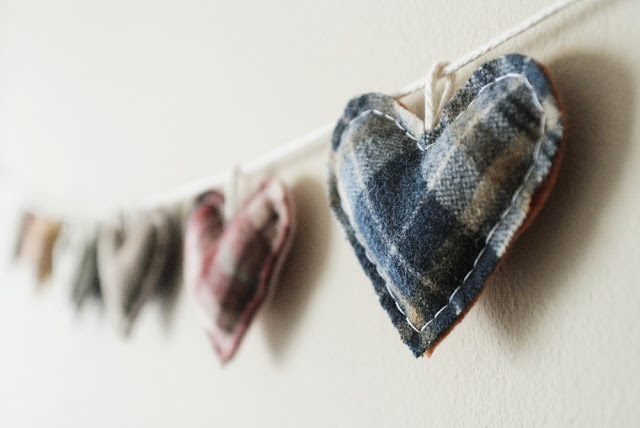 Hang this garland to bring some warmth and cozy to your space! Entirely hand cut and sewn using soft and buttery 100% wool fabric in a variety of patterns. Each heart measures 3.5 by 3 inches and is gently stuffed with Poly-Fil. Garland measures 4 feet in length with loops on each side for hanging. Fantastic! We will, we will rock you! 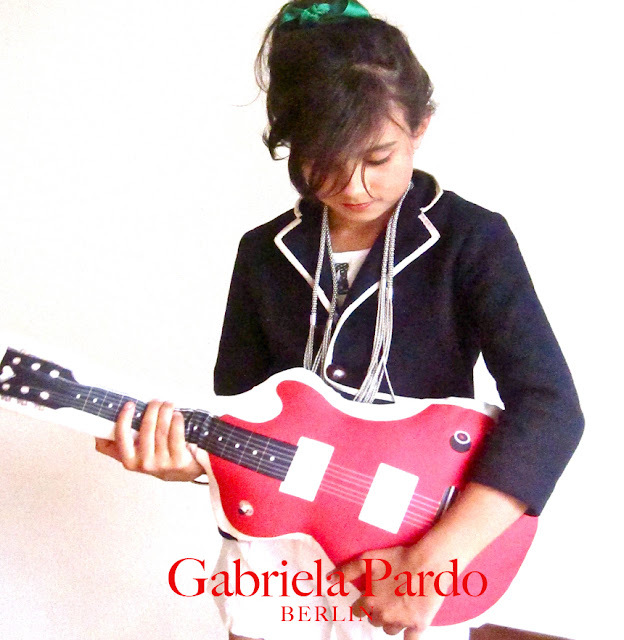 This red guitar pillow/cushion from Gabriela Pardo is made from silk cotton, is 30cm x 60cm and is machine washable. Printed with water based ink. Fantastic! It's been raining so heavily here lately I could do with one of these! 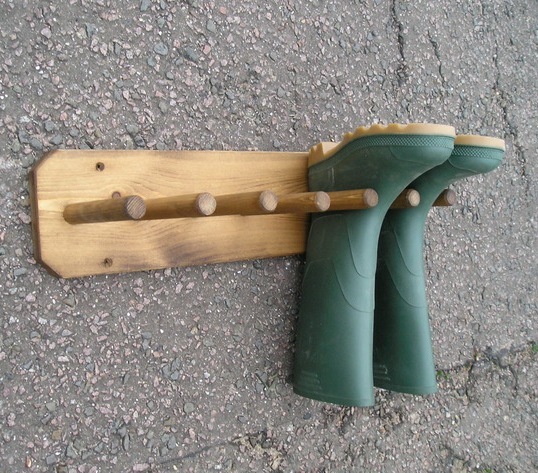 Wall mounted wellie boot rack – to keep the floor clear and tidy! Heavy duty - craftsman made in Suffolk, UK. The pegs are properly morticed into the backboard then glued and screwed for strength and durability. Treated with wood preservative for indoor or outdoor use. Traditional made to last craftsman quality. 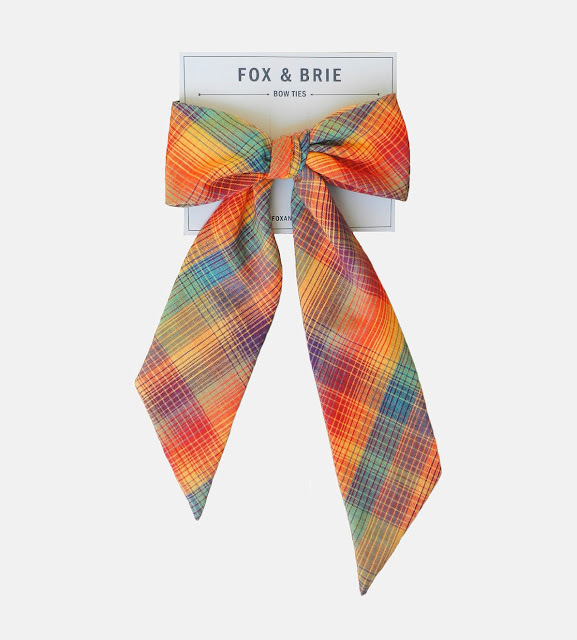 I'm loving the range of colours in this Ascot Bow from Fox & Brie. Made from multicolour plaid they are hand crafted in Austin, TX. 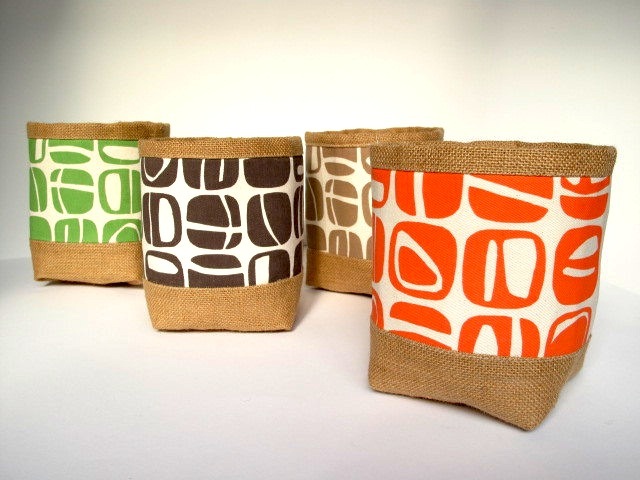 They are adjustable in length and made of 100% linen. Each bow arrives untied and ready to be styled! 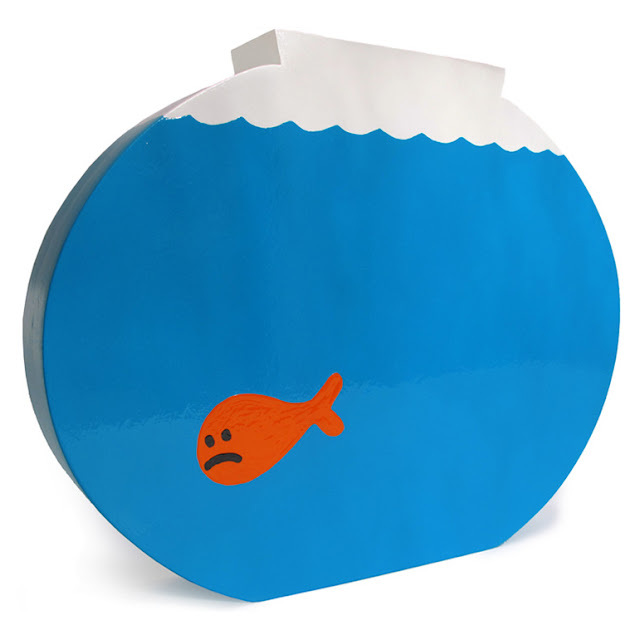 Great packaging too! 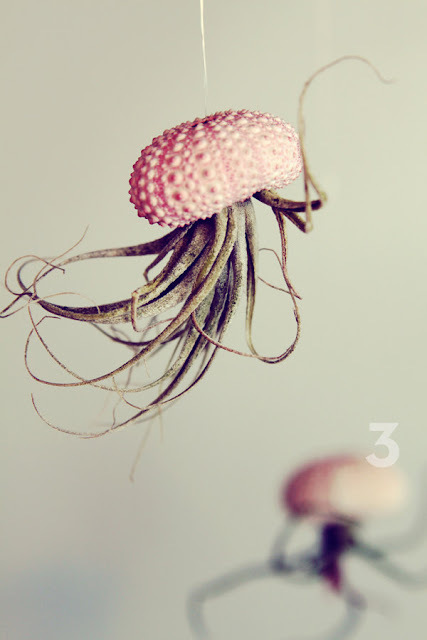 These funny little plants are masquerading as jellyfish! Just floating in their little sea urchin shells, waiting for someone to take them home. Air plants are really easy to care for. All they require is watering twice a week and a nice, bright room with indirect sunlight (or your desk lamp in the office) to thrive in. Complete care instructions are included. 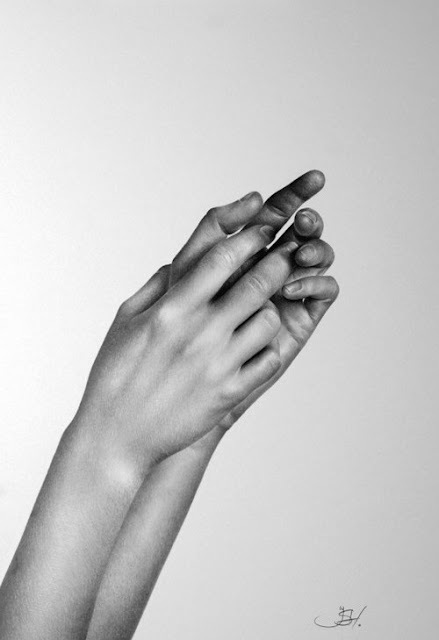 This fantastic fine art print is from an amazing original pencil drawing by Ileana Hunter. So amazing. 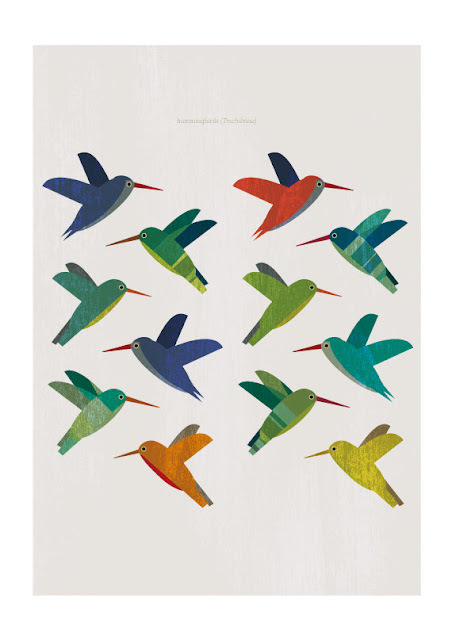 A magnificent quality print, virtually indistinguishable from an original. 297 x 210 mm or 11 3/4 x 8 1/4 inch (A4). Hand signed by the artist. Printed on 225 gsm acid free archival cotton paper. 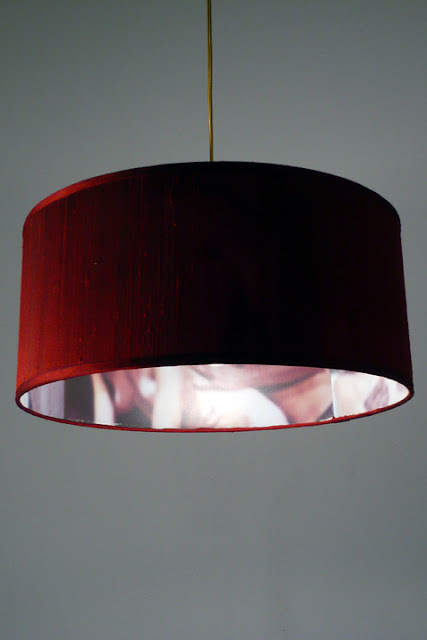 Made from Italian laid paper this handmade lampshade fits a large table lamp or, with a top fitting, it will also work as a pendant shade. The shade is lined with PVC to make it heat safe. Standard diameter 12" (30cm) and 8" (20cm) high. Beautiful! 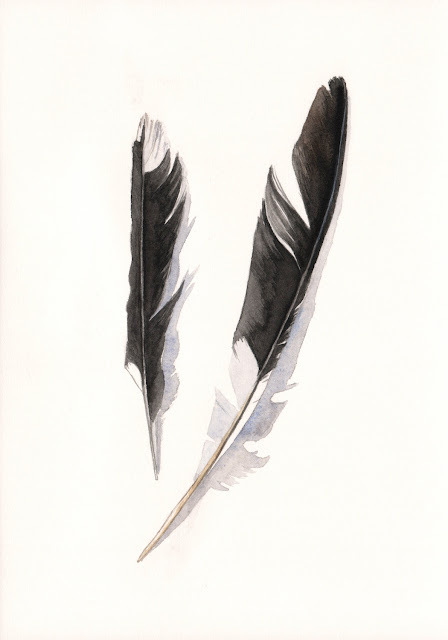 Magpie Feathers, a beautiful print of an original watercolor painting by Louise De Masi of Splodgepodge. Printed with Epson Ultra Chrome pigment inks on 310gsm Fine Art Paper. Paper Size: 5" x 7". Love it! 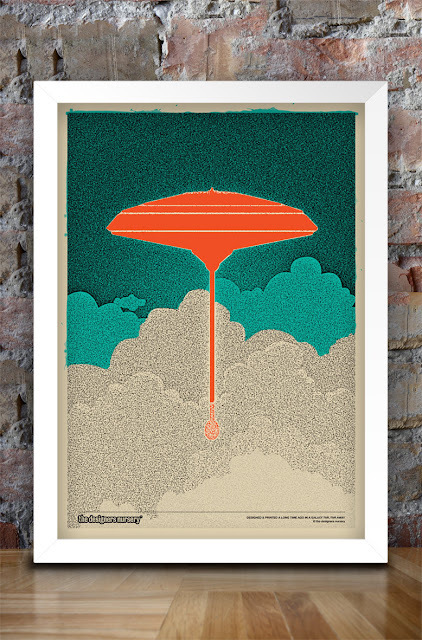 A striking print to brighten the chore of hanging out the laundry. Dempsey is an original design by Popsey and available in a choice of three colours – Chocolate, Charcoal and Petrol. 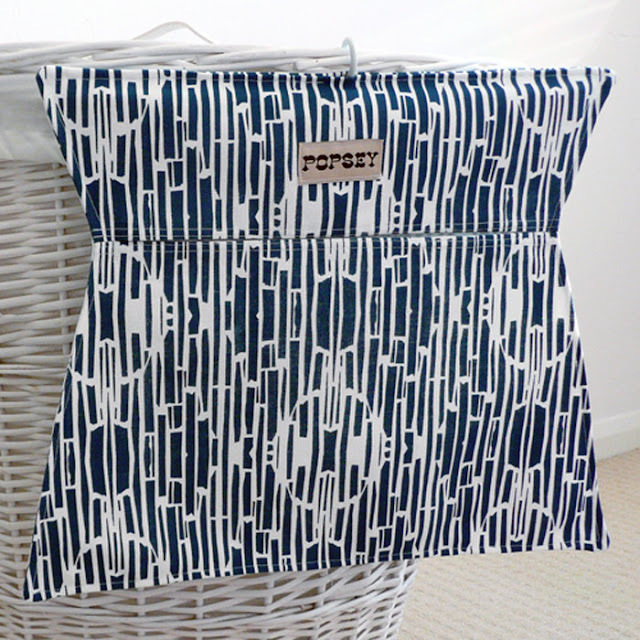 Hand screen printed with non-toxic water-based inks on white cotton duck fabric and handmade. Generous in size with a small neat hanging hook. Each bag is individual and made to order. Dimensions: 310mm (h) x 400mm (w) approx. 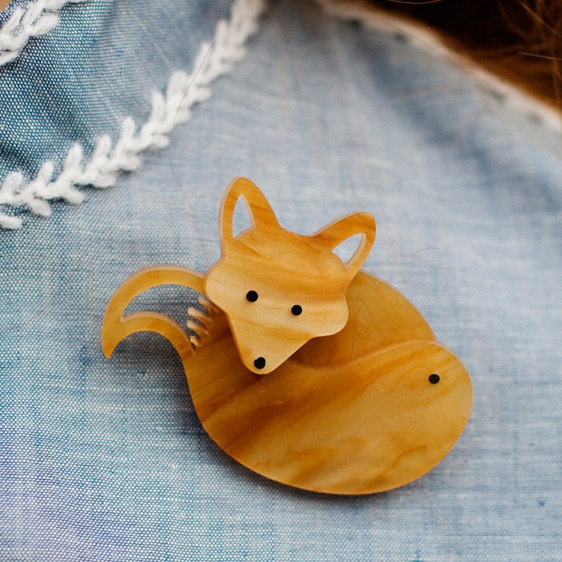 This curled-up fox brooch by Tatty Devine is elegant and adorable. It's cleverly constructed from three pieces so that its nose peeps out at an angle over the tail. 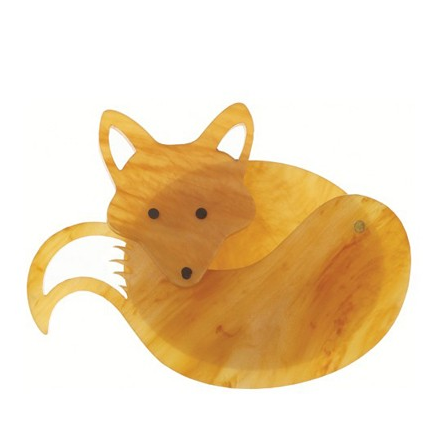 The warm tortoiseshell perspex captures the beautiful colour of the fox. Tiny black studs fasten it all together, forming the gleaming eyes and nose. Don't resist, you know you want to be a foxy lady! What Laura Palmer would wear on a hot date. Material: Sterling Silver. Chain: 80cm fine Sterling Silver. Dimensions: 3.5cm high x 3.5cm wide. Designer: Christopher Bril. Love it! Bordered image print made with Canon dye inks on professional grade premier imaging micropore luster paper. Created in Photoshop and dedicated to Jane Fonda, you can read a great description of this piece at the bottom of this Etsy listing. Bright red silk exterior with fabric trim. Interior is a collage of 3 cropped images from 1970’s erotica. Comes with 10’ black or gold coloured fabric cord with plug. I'm loving the hidden element of this everyday product – it suggests that everything needs a second look. Great idea. 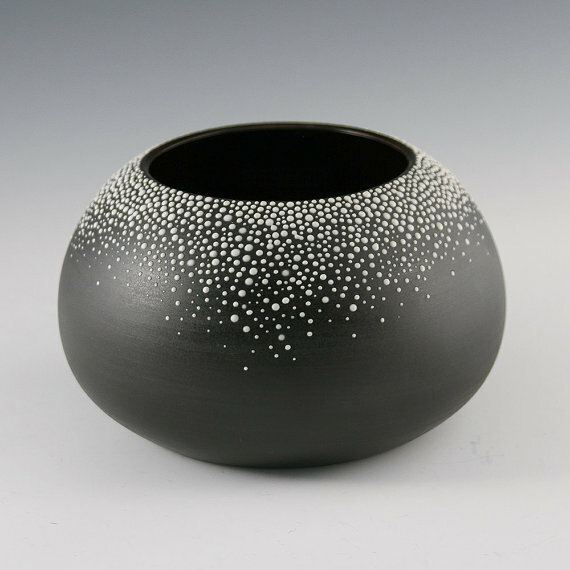 Beautiful hand-thrown porcelain orb vase hand glazed in satin black and accented with a pebble inspired slip design in white. The design is comprised of individually applied slip dots which are slightly raised above the surface. This gives the piece a wonderful, tactile texture and sculptural appearance. 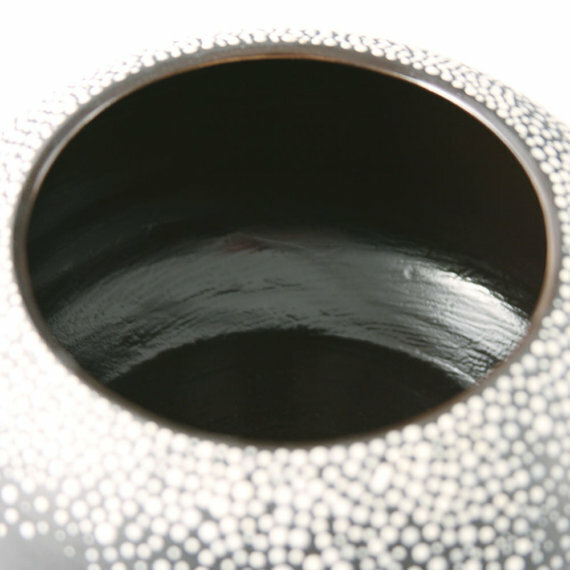 The interior of the vase is sealed with a glossy glaze while the exterior has a rich, satin matte finish. Measures approximately 4.5"H x 7"W with a 4"W opening. Water-tight. Storybox is the latest body of work produced by UK artist Andrea Boorman. All images are original prints, hand carved onto lino block and printed on laser cut boards to create a multi-layered product with real depth. 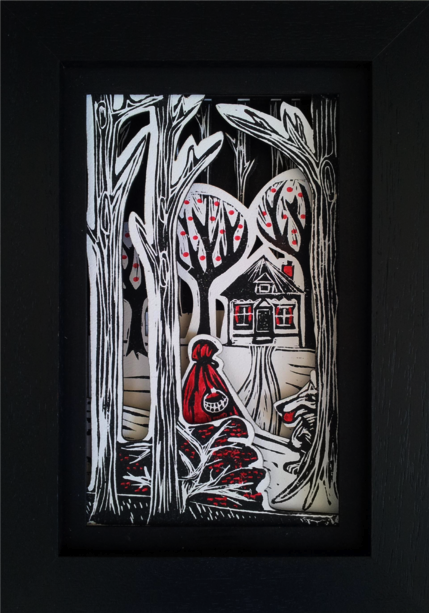 The image has been crafted from 4 printed layers and a further 11 spacing layers to build up a 3 dimensional scene from Little Red Riding Hood. 33.5 cm x 23.5 cm x 4.5 cm. A small decorative bottle shaped bud vase. 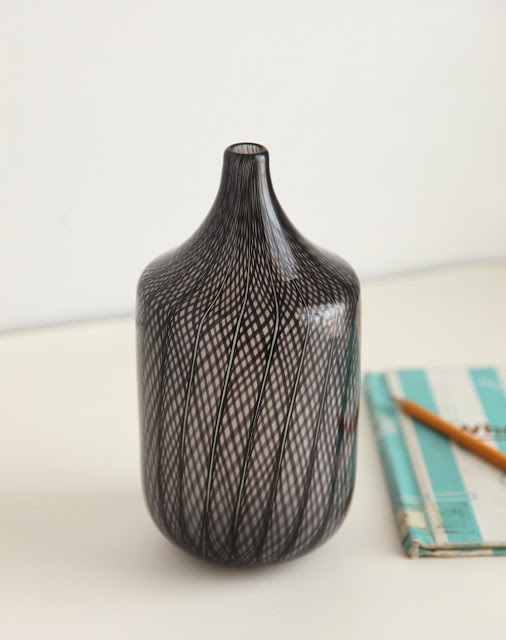 This petite and elegant vase is handblown in a classic bottle shape. 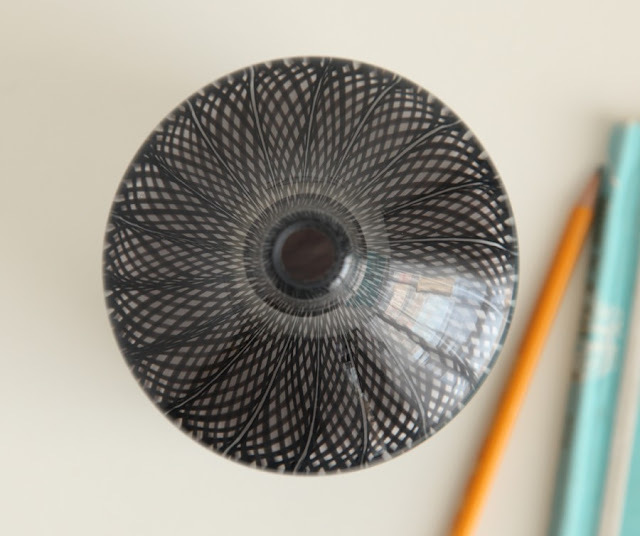 Hundreds of strands of black glass are delicately woven in a net-like pattern over clear glass. The interior surface is frosted giving the piece a soft inner glow. Measures 8 1/4" tall and 4 1/2" wide. I love this! Enamel paint on wood. 34 x 27 x 5cm. Weight 2.5kg. Each bowl is hand painted, signed and packaged in a screenprinted box. This is currently sold out but it's rumoured that Andy will be making another batch. Send him an email using the link below if you'd like to know when they are ready. 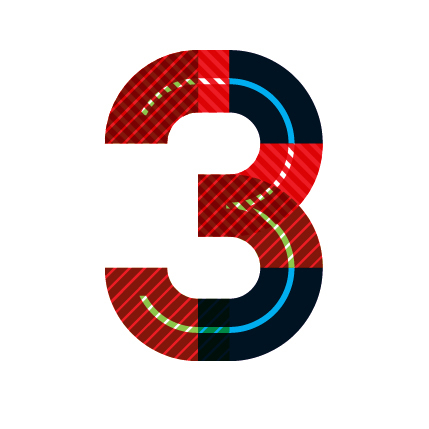 Today is our third birthday! Hurrah! A massive, massive thank you to you all for your continued support and for all your lovely words of encouragement, it really does mean a lot. 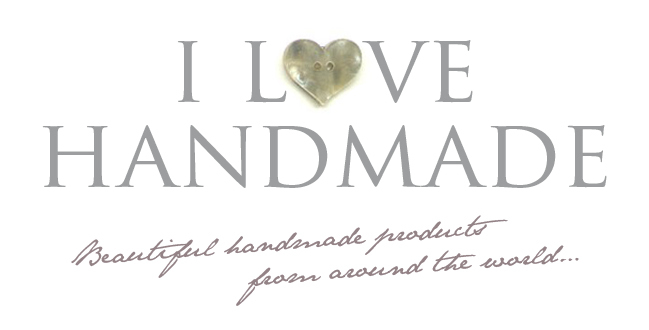 Today is a well earned day off, but we'll be back with more daily handmade loveliness tomorrow.